If you read my post on Perfect Piano Posture, you will now know how to find the best playing position at the piano, or at least you’ll know what to be aware of when you’re sitting at the instrument. Today I will take a look at what constitutes the perfect hand position. This is just as important as posture and without it, progress will be difficult. You’ll notice that in this ‘cupped’ position each finger is able to work ‘on it’s own’ independently of the hand. It is important that the fingers move on their own, i.e. they don’t rely on hand muscles when they move. It’s more effective if the fingers work on their ‘tips’ too so that each one is encouraged to play cleanly and accurately (as I’m showing above). Fingers should be able to work freely from the knuckles, you can see them in position in the photo above too. Finger strength is paramount when developing piano technique, so hand positions should merely encourage this. A flat or slightly inverted hand seems to stop each knuckle and the surrounding muscles from building up any strength so be mindful of this when developing your ideal hand position. 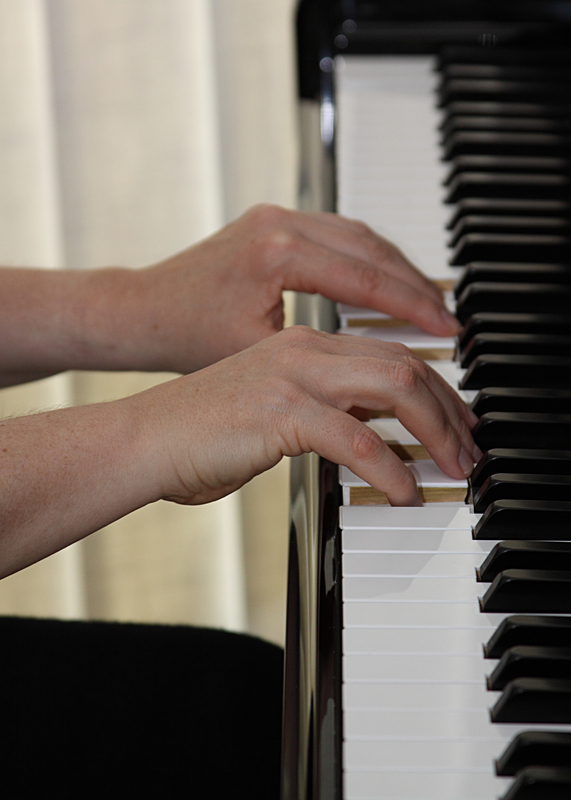 This last point is especially important when focusing on the fourth and fifth fingers – it’s all too easy to leave them out and a good hand position really helps them find their strength. High wrists tend to encourage tension and rigidity so with this is mind, it’s better to allow the wrists to sit in a low relaxed position as above. Whilst the photo may give the idea of one rigid hand position, this is not true at all because it is merely a starting point; the hand and wrist should be flexible and free at all times so the fingers can move easily and quickly, guided by an agile, light arm and hand. Tension in the hand should be stopped as soon as possible as this will only impede movement. The more motion and movement made by the hands and wrists, the freer and more comfortable your hand positions will feel. Lateral wrist motion is particularly important in ensuring flexibility. So don’t allow your hands to be stiff or ‘stuck’ in one position. Try to develop a completely relaxed feeling when focusing on your hand positions. As always, a good teacher will help in this direction enormously as it’s a tall order improving aspects of piano technique alone. Good luck! Image: So You Want To Play The Piano? published by Alfred Music.